The top of a full size mattress is approximately 54 inches by 75 inches. Our full size duvet cover measures approximately 84 inches by 91 inches, this will give you plenty of room to install the interior filling which would be your comforter or duvet. A comforter or duvet is basically the same thing except the duvet can tend to be a bit fluffier. The product for sale here is the duvet cover. The duvet itself can also be ordered here as an option, as can a set of sheets which will match your duvet cover. Our pure cotton flannel duvet covers are the epitome of tactile comfort and warmth. Anyone who has slipped a quality flannel shirt over their skin on a cold morning can attest to its undeniable appeal. Our flannel has a generous weight of 4.3 ounces per square yard and is imported from Portugal, the birthplace of the finest flannel for over one hundred years. 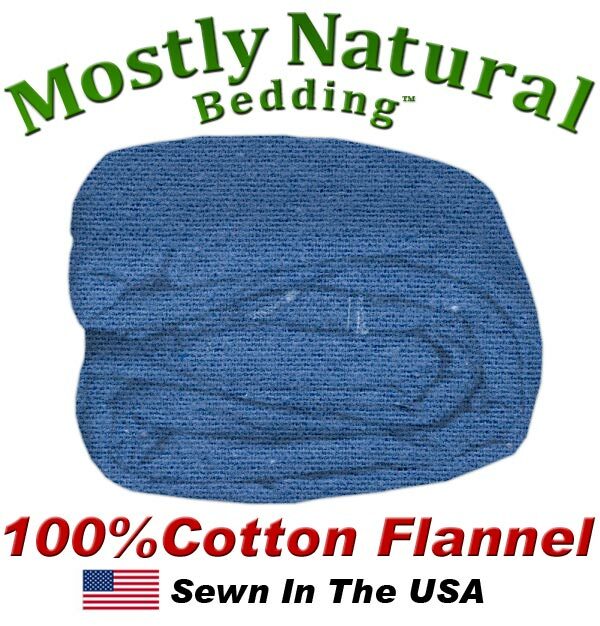 We take this fabulous flannel and carefully craft it into great bedding, here in the USA! Fabric color can vary a bit from picture for many reasons. DUVET COVER CLOSURE: We use a zipper closure system at the duvet cover foot. SHIPPING: 95% of our orders ship within 7-10 business days. Please allow standard ground transit time depending on your location. If you add a duvet insert to your order the duvet insert may ship separate and take a few extra days. OPTIONAL: You can add an optional duvet insert (or more correctly duvet) to your duvet cover order. We have five choices for this. Please order above. Discount Duvet: Add a light weight duvet with bonded polyester fill, a white color poly cotton blend shell fabric with a tack and jump quilt pattern. Good Duvet: Add a medium weight duvet with bonded polyester fill, a white color poly cotton blend shell fabric and a square quilt pattern. Better Duvet: Add a duvet with poly silk like filling that feels and responds just like down. This duvet is a medium all weather fill with a white cotton shell and up market box stitching. Enjoy the feel of down without the price. Best Duvet: Add a duvet with genuine down and feather filling, approximately half of each. This duvet is a medium all weather fill with a white cotton shell and up market box stitching. Ultimate Duvet: Add a genuine down duvet, considered the ultimate. This duvet is a medium all weather fill with a white cotton shell and up market box stitching. OPTIONAL: You can add an optional matching sheet set to your order. The color and fabric will be the same as your duvet cover. The sheet set will come with a top sheet, bottom sheet and pillowcase. Please order above. OPTIONAL: You can add an optional waterproof mattress pad to your order. Our mattress pad uses a vinyl core with two layers of absorbent polyester on either side. For your added protection, this polyester has an ultra fresh anti-bacterial finish. Special pinsonic quilting preserves the waterproof integrity. The corners of this mattress pad are held in place by 2 inch wide bands. Please order above. RETURN AND CANCELLATION POLICY: Please note that our sheets, comforters and mattress pads, etc. are all custom sewn for you when you order. We do this so we can offer many colors and custom sizes, thousands of combinations, in fact! Because our bedding is custom for your order, please order carefully. Cancellation of an order is generally impossible as we start sewing ASAP. We can only accept returns within 30 days of order, a 50% re-stock fee will apply, and the bedding must be in original packaging. Bedding that has been used or washed is not returnable. Please note that you are responsible for all shipping costs. Flannel Duvet Cover Full Size Denim Color Soft and Warm.